I had to share this art­icle with you because it’s excit­ing to finally see stud­ies look­ing at the wis­dom of herb­al medi­cine for com­mon health issues, and this art­icle looks at food allergy relief, one of my favour­ite top­ics in treat­ment in my office! Food aller­gies (par­tic­u­larly aller­gies that are dir­ec­ted by a spe­cif­ic pro­tein called IgE or immun­o­globulin E) are not only incon­veni­ent, but they can be scary, espe­cially when they involve hives, swell­ing, and dif­fi­culty breath­ing. Our cur­rent treat­ment is mainly avoid­ance, with the obvi­ous treat­ments of anti­histam­ines like Benadryl or even adren­aline through an EpiPen if the food aller­gen expos­ure causes ana­phyl­ax­is. As a natur­o­path­ic doc­tor, part of my work involves pre­ven­tion, calm­ing immunity and react­iv­ity over time. For food aller­gies, decreas­ing the react­iv­ity of the immune sys­tem could ulti­mately not only pre­vent dis­com­fort, but add life-sav­ing minutes onto a life on expos­ure to an aller­gen. 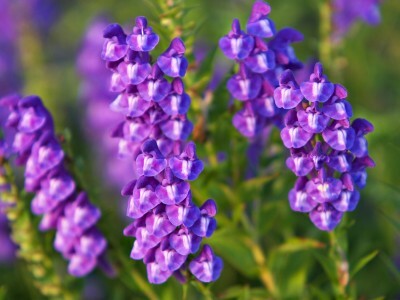 This art­icle looks at a herb that I reg­u­larly include in my allergy for­mu­las that I make for my cli­ents called Chinese Skullcap, or in its lat­in name, Scutellaria baicalen­sis. Please see the link for this art­icle. To sum­mar­ize for those inter­ested in the Coles’ notes ver­sion, it basic­ally says that when mice were giv­en Chinese Skullcap, their over­all react­iv­ity decreased sig­ni­fic­antly includ­ing a sup­pressed ana­phylact­ic reac­tion, decreased pro­duc­tion of cells that induce allergy (includ­ing IgE and oth­er chem­ic­al medi­at­ors), and decreased body tem­per­at­ure (which is asso­ci­ated with inflam­ma­tion). Pretty cool huh? I’m a geek, so I was excited. There are lots of cool things in herb­al medi­cine to sup­port immunity. I’m liv­ing proof! I’m look­ing for­ward to see­ing more of these stud­ies com­ing to light. Muluye RA, Bian Y, Alemu PN. Anti-inflam­mat­ory and Antimicrovial Effects of Heat-Clearing Chinese Herbs: A Current Review. J Tradit Complement Med. 2014 Apr;4(2):93 – 8. doi: 10.4103÷2225−4110.126635.